"She knows the whole goddam movie by heart, because I've taken her to see it about ten times. When old [Robert] Donat comes up to this Scotch farmhouse, for instance, when he's running away from the cops and all, Phoebe'll say right out loud in the movie — right when the Scotch guy in the picture says it — "Can you eat the herring?" She knows all the talk by heart. 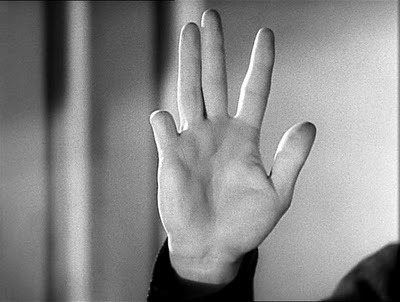 And when this professor in the picture, that's really a German spy, sticks up his little finger with part of the middle joint missing, to show Robert Donat, old Phoebe beats him to it — she holds up her little finger at me in the dark, right in front of my face. She's all right. You'd like her." New Yorker writer Lillian Ross recently reminisced about a letter she received from him about a trip he took to London with his children. He took them to see Engleburt Humperdink in the stage production of Robinson Crusoe. 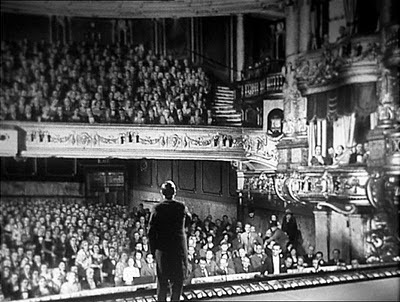 "Awful," he wrote, "but we all sort of enjoyed it, and the main idea was to see the Palladium itself, because that's where the last scene of The 39 Steps was set." Mr. Memory at the Palladium. 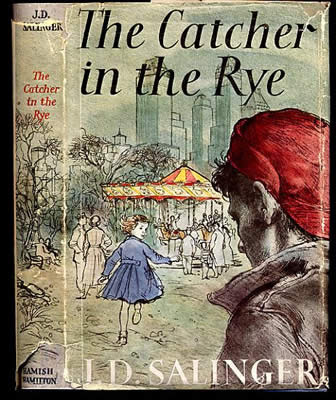 When Salinger died last month, I, like every other male born in the second half of the 20th century, was saddened, the loss made all the more poignant because he was like a friend I hadn't seen in many years. Unlike Holden, old Salinger loved movies and had a decent collection of 16 mm films, the kind they used to use in school. I have a fantasy about meeting him. But instead of sitting down for an earnest conversation about writing, or Seymour, or Franny, I'd rather drop by his place and cook a batch of stovetop popcorn. Jerry would be in the living room threading The 39 Steps through his rackety projecter. Then we'd pull the shades, grab a spot on the couch, and bring Mr. Memory back to life. I can't think of a much better way to kill an afternoon. Am I right, sir? Ok, I'd been thinking I might re-read Catcher because of the 16mm thing, but this. No way! That's awesome. Thank you for this post. I have a feeling that Phoebe and I would have gotten along great. I thought you WERE Phoebe, all grown up! Thanks! I did an extensive post on 39 Steps in my blog this week. I was inspired in part by this post and in part by the PBS Masterpiece theater adaptation. I guess I am Phoebe, with the power of the internets.